Trausnitz Castle and the bell tower of St Martin's Church are both historic landmarks located in the city of Landshut in the Bavaria region of Germany. The landmarks are lit up at dusk and can be seen clearly from this view across the Isar River. Trausnitz Castle can be seen here lit up at dusk along with the bell tower of St. Martin's Church; both of these tourist attractions are famous landmarks in the city of Landshut in the Bavaria region of Germany. The colours of the lights and the reflection of the buildings in the water give this castle and surrounding area a magical feel. 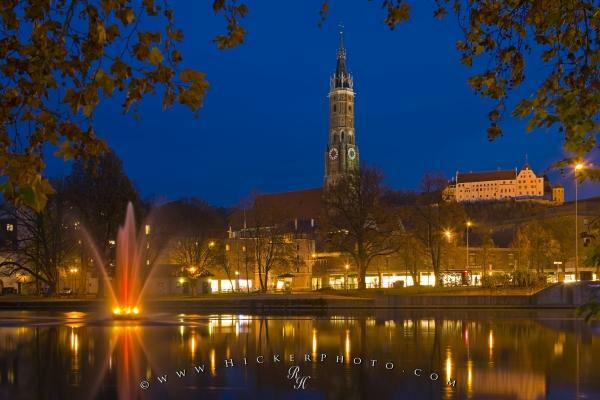 Photo of two historic landmarks - the Trausnitz Castle and St Martin's Church in the City of Landshut, Germany. The bell tower that can be seen reaching straight up in to the sky is the bell tower of Martinskirche, or St. Martin's Church in English. This is one of the most important buildings in Landshut and is not only the highest building in Bavaria, but is also the highest brick building in the world. The bell tower reaches up to 130.6 metres. View of Burg Trausnitz (Trausnitz Castle) and the bell tower of Martinskirche (St Martin's Church) from the Isar River with a fountain in the foreground at dusk, City of Landshut, Bavaria, Germany, Europe. I photographed this photo with the digital SLR camera model Canon EOS-1Ds Mark III, aperture of f/8.0, exposure time of 13/1 sec. on ISO 100, as always I used a original Canon Lens, the focus lenght for this picture was 38mm.